Pocketbook released a set of screenshots this morning which inadvertently reveal more details about the Pocketbook Ultra, their upcoming high-end ereader which has yet to be officially announced. The screenshots show the interface that Pocketbook will be using on their next ebook readers, and while there's no specific mention of the model it does appear that these screenshots came from the Ultra. 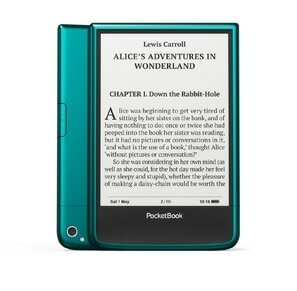 The Pocketbook Ultra will be a 6" ereader with a Carta E-ink screen and a rear facing camera and OCR capabilities. Or at least that is what the leaks have suggested and now the screenshots have confirmed. If you flip through the screen shots you'll see that they are in grayscale, just like what you would expect from an ebook reader with an E-ink screen. The text is in Russian Ukrainian, so there isn't much that I can get out of it, but if you look at the first and the last screenshots you will probably notice the word "KAMEPA". If you phonetically translate that from the Cyrillic characters you will get the word camera. That is about the limits of my abilities to read Russian Ukrainian, but the other screenshots show symbols which suggest features like text to speech. And if you can read it you will probably be able to pick up other clues. The screenshots are embedded in a gallery below, and if you want to download a copy of the screenshots here is a ZIP file. It is not in Russian, but in Ukrainian. The picture no. 2 has the middle icon labeled “Golos” – means “Voice”. So it could mean TTS, but also volume for mp3 player. I have seen [leaked photos of] exciting prototypes of PocketBook devices in the past and the device itself came out much later and looked very different and had different functionality. I got this from a Russian ereader blog, and they got it from Onyx’s Russian partner. Obviously I made a bad assumption. The languages are *very* similar. Ukrainians have a few letters that Russians do not have. So at least the first printscreen is in Ukrainian. This is no big deal, but if you were trying to use translate.google.com, for example, then you should set the language correctly to get proper results. Pocketbook has released a second set of screenshots, this time in English. Only 6 screenshots were released this time; they left out any mention of the camera or other interesting features.